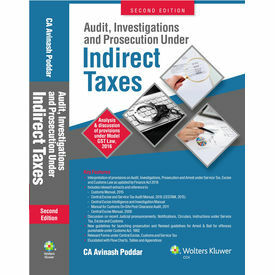 Audit, Investigations and Prosecution under Indirect Taxes, published by CCH (Wolters Kluwer), is a comprehensive book for Tax professionals, CA and Law students. The title deals with the provisions of Audit, Investigations & Prosecution under the three indirect laws i.e. Excise, Customs, and Service Tax. The taxation system in India works on the principle of self-assessment i.e. the assessees need to determine their tax liability, compute the same on their own and remit duly with the concerned Revenue department. It is the responsibility of the Government Officers to identify whether the correct revenue is being declared in the returns and taxes as applicable on it is being paid. The title discusses about steps taken by the revenue officers to prevent the revenue leakage, how they detect who are responsible for the leakage and the provisions of prosecution & arrest to punish the responsible person. The provisions have been discussed with the practical approach adopted by Revenue Officers which are further explained with the help of Flow Charts and Tables. Avinash Poddar is a Chartered Accountant and a Senior Partner at M/s A A P and Co., Chartered Accountants, Surat (Gujarat). He is also a law graduate (LL.B. ), Certified Financial Planner (CFPCM), Microsoft Certified Professional (MCP), qualified DISA from ICAI, Post Graduate in Cyber Law (PGCCL) and has earned Certification from ICAI in Arbitration, Forensic Accounting and Fraud Detection, Valuation, IFRS, Indirect Taxes. He is a certified Internal Auditor (CIA – USA), Fraud Examiner (CFE-USA) and Information System Auditor (CISA – USA). He deals with the practical aspects of Service Tax/ Excise through his advisory role in various organizations. He also represents his clients before adjudicating authorities, Appellate Authorities including CESTAT and Settlement Commission. Presently, he is pursuing Ph. D in “Convergence of Excise, Service Tax and VAT into GST and its likely impact on Industries of Gujarat”.